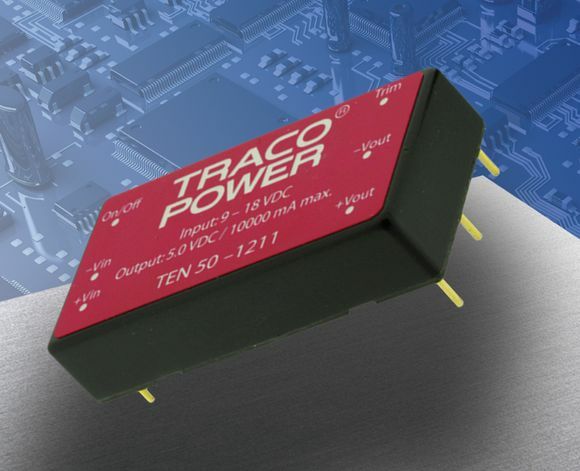 TRACOPOWER launches the high performance TEN50 Series with 12 models providing 50W power in a 1”x 2”x 0.4 “ compact package. Today already almost all of applications require a high efficiency of a voltage conversion. When we add to this requirement also saving of space and a galvanic isolation, we´ll get to widely used components – DC/DC modules. The TEN 50 Series models feature a very high efficiency of up to 92%. Excellent efficiency is maintained in over a wide load range and no minimum load is required for an accurate output regulation. They are available in three basic groups – TEN 50-12xx, TEN 50-24xx a TEN 50-48xx with a wide input voltage range (2:1).